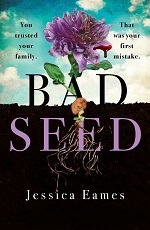 Trapeze (Orion) has signed Bad Seed, a dark family drama by a publishing insider writing as Jessica Eames. Commissioning editor Katie Brown bought world and film/TV rights directly from the author, for publication this Halloween. Bad Seed is about a mother and daughter, and secrets unearthed following a father's death. The story is partly inspired by the author's own experience. Eames said: "Writing Bad Seed was something of a cathartic process for me - following the death of my mother at a relatively early age, my dad went through a series of relationships, and when he married my (now ex-) step-mother, it really tore the family apart. While Bad Seed is not exactly reflective of my own experience, looking back at this difficult mother-daughter relationship I had as a teenager made me think about how a relationship that's supposed to be ultimately supportive and nurturing can turn very toxic in the wrong set of circumstances: that was the starting point for my characters, Nicola and Sarah. I'm beyond delighted that it's found a home with the absolutely brilliant Katie Brown, who is one of the most creative editors I've met, and Trapeze, who I hugely admire." Brown said: "Jessica is pulling no punches with this novel: she left me breathless with anticipation, crying after a surprising turn in the first part of the novel, and absolutely desperate to read on and find out the truth. I feel incredibly lucky to be working with Jessica, who is a complete natural and pours so much of herself into her work, and I am positive Jessica is going to be a reader favourite for many years to come. Trust me when I say she is a talent to watch."